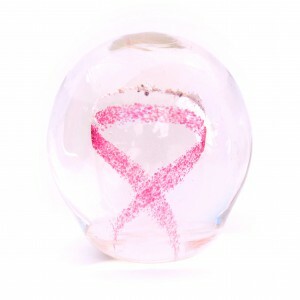 Memory Glass, an international cremation memorial company, announced that its newest product, the “Pink Ribbon” Breast Cancer Tribute Orb, was launched at this year’s NFDA Convention in Indianapolis, IN. The company will donate 10% of all proceeds from this product to the American Cancer Society. The new Memory Glass “Pink Ribbon” Breast Cancer Tribute Orb was launched at NFDA 2015 in Indianapolis, IN. The goal in developing this Tribute Orb was to create a memorialization piece to honor the fighting spirit of loved ones who have battled this devastating disease. Similar in size and basic shape as a large Memory Glass Orb, the Tribute Orb is a solid, clear crystal glass memorial containing a ribbon-shaped pink glass design. A small amount of cremated remains is fused within the glass, floating above the ribbon. Timed with October’s Breast Cancer Awareness month, this product is now available to all Memory Glass vendors. Aside from breast cancer, the Tribute Orb can honor those lost to other cancers simply by changing the ribbon’s color to any one of Memory Glass’s 16 available colors. If you missed the Memory Glass booth or weren’t able to attend the convention, visit http://vendors.memoryglass.com to learn more. Established in 2002, Memory Glass creates customizable solid glass keepsake memorials that preserve cremated remains, soil from a burial site or sand, which are suspended within the glass. Memory Glass products are available in nearly 1,800 funeral homes and pet crematoriums in all 50 states, Canada, Australia, and the U.K.